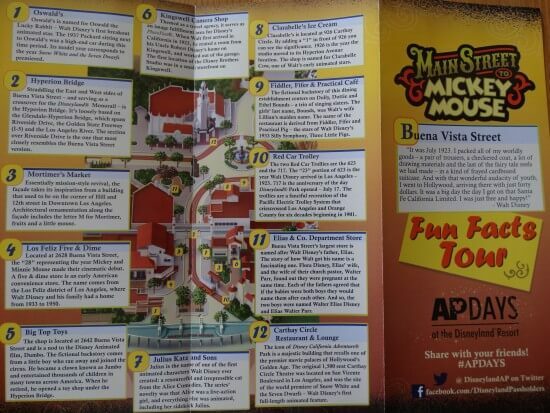 Back in February, we took an in-depth look at the Main Street, USA Fun Facts Tour that was handed out as a pamphlet during the “AP Days” event at Disneyland Resort. Now this month, in celebration of Disney California Adventure’s 15th anniversary, let’s examine Disneyland’s sister park’s Main Street equivalent, Buena Vista Street, which has plenty of fun facts and hidden references of its own. Buena Vista Street’s own Fun Facts Tour was on the flip-side of the Disneyland pamphlet during the first week of AP Days. Here’s hoping Disneyland Resort continues to plan fun informational events like this for the continued celebration of its 60th anniversay!